Barksdale Air Force Base is located in the northwest corner of Louisiana (Bossier Parish) Bossier City, Louisiana. The base is two and half hours east of Dallas, Texas and three hours west of Jackson, Mississippi. Additionally, you will have easy access to other major cities in Texas, Arkansas and Mississippi, a region known as the "Ark-La-Tex" (Arkansas, Louisiana and Texas). The zip code for the base is 71110. 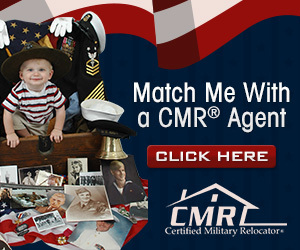 The climate, location and military environment make this area a popular place for military retirees and their families to call home. You will find Bossier City and Shreveport (its sister city located just across the Red River from Bossier City in Caddo Parish) great places to work and play. Barksdale has proudly served the Ark-La-Tex (Arkansas , Louisiana and Texas) area for more than 68 years. As a key Air Force Global Strike Command base, Barksdale has a pivotal role in providing a large part of the nation's deterrent force. Barksdale is home to the 2nd Bomb Wing, 2nd Operations Group, 2nd Maintenance Group, 2nd Mission Support Group, the 2nd Medical Group, Eighth Air Force Museum (which maintains the historical aircraft and artifacts that grace the base) and the Air Force Reserve’s 307th Wing. 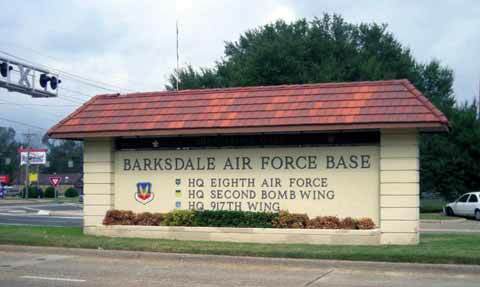 Also calling Barksdale home is the newest MAJCOM in the Air Force, Air Force Global Strike Command (AFGSC), and the “Mighty Eighth” Air Force, of World War II fame. Barksdale AFB is located in Bossier City, Louisiana, and provides easy access to other major cities in Texas, Arkansas and Mississippi. Interstate 20 runs East/West through Shreveport/Bossier City with Jackson, Mississippi 220 miles to the east and Dallas, Texas 185 miles to the west. Little Rock, Arkansas is 175 miles northeast of the metropolitan area and Interstates 49S and 10E provide access to the "Big Easy", New Orleans, 300 miles to the southeast. Barksdale is located on the Southwest side of Bossier City and can be easily accessed from interstates 20 and 49. From the East on I-20, take Exit 22, Airline Drive, turn left at the traffic light. Take another left at the next light onto Old Minden Road (LA-72). Stay in the right lane as it merges onto Northgate Drive, ending at the Bossier gate of Barksdale (open 5:30 a.m. -9:00 p.m. daily). From the west on I-20E, take US 71S/Barksdale Boulevard Exit 20C. Turn left at the sixth traffic light onto Barksdale Blvd (Hwy 71). Stay in the left lane for approximately 1/2 mile to the Shreveport Gate (open 24 hours daily). From the south on I-49, exit onto Bert Kouns Industrial Loop and travel east to 70th Street crossing the Red River into Bossier City. Turn left at the intersection of 70th Street and U.S. Highway 71. Continue through five traffic lights. Turn right into Barksdale via the Shreveport Gate (open 24 hours daily). If you arrive by air, Shreveport Regional Airport is the airport at which you will arrive. The airport is located at 5103 Hollywood Avenue, west of downtown Shreveport. Jet service is provided by American Airlines, Continental Air Lines, Delta Airlines and Allegiant Air (Las Vegas only). If you do choose to rent a vehicle, you will need to cross Hollywood Avenue to Monkhouse Drive. Take Interstate 20 East through Shreveport and into Bossier City, Please drive defensively. Take Exit 22, Airline Drive, turn right at the traffic light, go over the railroad tracks. Take a left at the next light onto Old Minden Road (LA-72). Watch the traffic light, there is a turn arrow. Do not get caught in the middle of the intersection waiting for an opening or the signal to give you the turn arrow. Stay in the right lane as it merges onto Northgate Drive, ending at the Bossier gate of Barksdale AFB (open 5:30 a.m. to 9:00 p.m. daily). Present your proper identification to the gate guard and proceed to the Barksdale Inn (the gate guard will direct you), it's the first building on your left. The lodging staff can help you contact your unit First Sergeant. No listings found for Barksdale Air Force Base.